On January 25, 2019, the Honourable Jim Carr, Canada’s Minister of International Trade Diversification publicly announced Canada’s highly anticipated participation in Expo 2020 Dubai. This marks an important milestone for Canada to display its innovation, knowledge and expertise in business and cultural pursuits. Prior to its confirmation, the Canadian Business Council (CBC) Abu Dhabi, along with CBC Dubai and the CUBC (Canada-UAE Business Council in Toronto) had chosen to be proactive in their strategic roles as facilitators, in a collaborative effort to communicate to the Canadian Government that it was clearly in the national, economic and cultural interest of Canada to commit to a national pavilion at Expo 2020 Dubai. The group had approached hundreds of Canadian companies in the UAE to request their pledge of support and commitment to participate at this historic universal exposition. In November 2018, CBC Abu Dhabi organized a roundtable discussion with Carmen Sylvain, the Government of Canada’s Expo 2020 Dubai representative. This blue sky meeting, led by CBC Abu Dhabi’s Secretary of the Board, Hans Fraikin, was held to gather feedback on the priority themes, objectives and messages that could be addressed and conveyed by Canada through the Expo 2020 event. CBC Abu Dhabi will continue its dedication to the development of trade and corporate investment between Canada and the UAE through its COI. 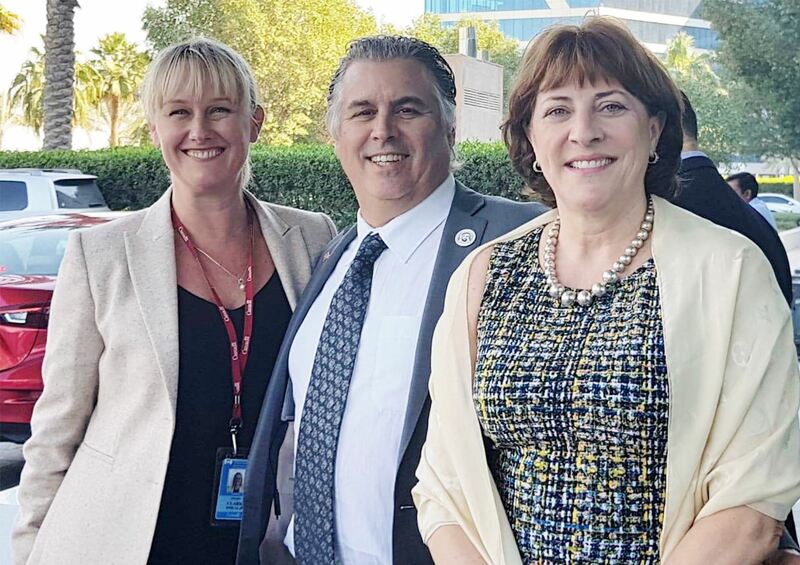 From left to right: Georgia Clark, Cultural Arts Officer of the Embassy of Canada; Hans Fraikin, Member of the Board and Head of Communities of Interest (COI) : Advocacy of the Canadian Business Council Abu Dhabi; Carmen Sylvain, former Canadian Diplomat and former President of the Bureau of International Expositions.